The basic premise of the show is a middle-aged man listening to one of his favorite musical theater cast albums to cheer himself up when he's feeling blue. He talks directly to the audience as if we're sitting in his living room, commenting on what he likes and doesn't like about the 1928 (fictional) musical The Drowsy Chaperone. This musical-within-the-musical has a typically silly and romantic plot about a wedding that almost wasn't, plus the obligatory gangsters and showgirls. But the story of the musical isn't important, what's important is how the musical makes "man in chair" feel. Any of us who love musicals in general, or one particular musical in particular, can relate to that feeling of playing your favorite album on the record player (or iTunes) and escaping into the world of the show. That's what The Drowsy Chaperone does for the man, and that's what it does for the audience too. It's a fun, funny, and entertaining show, with a little bit of commentary on the musical theater form and society in general. Director Joe LaForte has assembled a strong and enthusiastic cast, and keeps the tone light and campy. As the man in the chair, Michael Maloney is a great host with an easy rapport with the audience. As the titular chaperone (who's drowsy because she's drinking - during Prohibition! ), Kayla Hambek is a hoot with a big voice. Scott Ragan's bio says he loves "hamming it up as Robert," and ham it up he does in the role of the groom, along with some impressive blindfolded roller-skating! Kim Sykes is lovely as his bride Janet, and really shines in what is probably the most well-known song in the show, "I Don't Wanna Show Off." Adam Murdock brings the comic relief as the lothario Adolpho, with Rogelio-like clueless arrogance and charm. The two gangsters, typically played by two men, are here played by a man and a woman, Matthew Wehling and Dorothy Owen, which totally works and adds a different dimension. The set and costumes* are impressive for a community theater. Cindy Forsgren's costumes include some lovely '20s-era gowns and smart suits. The set (designed by Robin McIntyre) easily transforms from a run-of-the-mill (although quite large) apartment into the glitz and glamour of the '20s with the addition of a few pieces. Last but not least I must mention the orchestra, directed by Benjamin Young, sitting in a makeshift pit just in front of the stage and sounding great (making me rue the day I gave up the clarinet!). 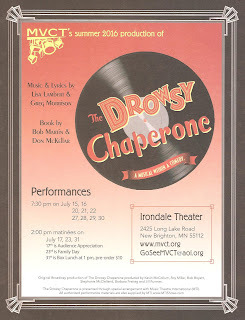 If you're in the Mounds View area, check out MVCT's delightful production of The Drowsy Chaperone, a new musical with a classic old-fashioned musical feel. And if you're not near Mounds View, find out what your local community theater is up to this summer and consider supporting them. 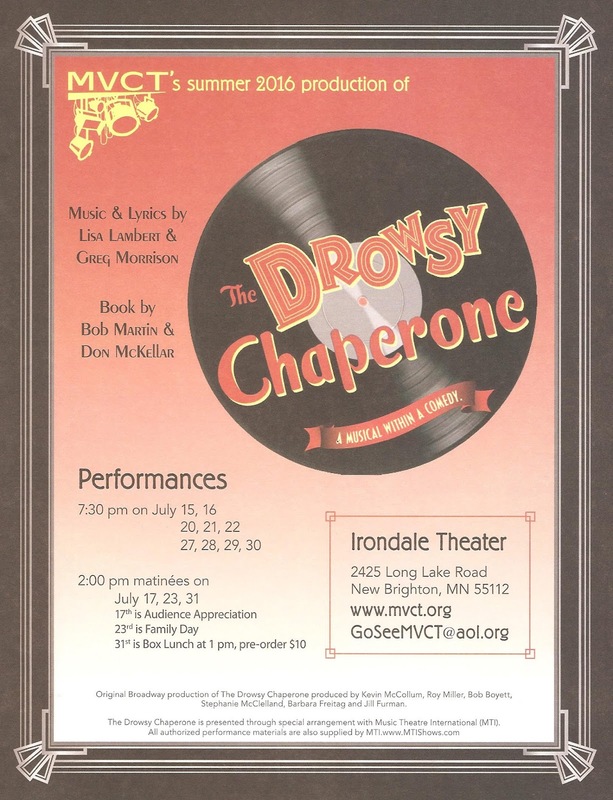 *I hear that the set and costumes will be somewhat shared with Artistry's upcoming production of The Drowsy Chaperone next month. I look forward to seeing the transformation to another space and cast, and to spending a few more hours with the man in the chair appreciating musical theater. Marvelously articulate review, BTW (as always)! thanks anonymous - are you available for hire as an editor? obviously I could use one!